Just a 25-minute drive from downtown, Grouse Mountain presides majestically over North Vancouver. The Grouse Grind™, a trek up the face of the mountain, is such a popular hike in Vancouver that it's even been trademarked. Locals often refer to the 1.8 mile slog up 2,800 feet as "Mother Nature's Stairmaster." Something of a cult classic among fitness buffs, the trek is more aerobic than scenic until you get to the top. The prize for huffing and puffing your way up is a glorious, panoramic view of downtown Vancouver, Washington's Mt. Baker, the Pacific Ocean and - off in the distance - Vancouver Island. If you’re not looking for a work-out you can still get to the top by stepping onboard the famous Grouse Mountain Skyride. 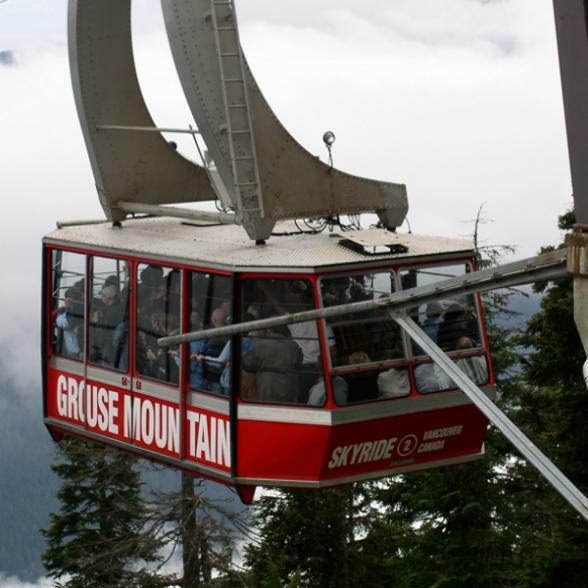 North America's largest aerial tramway is your gateway to the majestic nature of the Peak of Vancouver and is an experience in itself. High above towering Douglas firs, breathtaking views of the city of Vancouver, sparkling Pacific Ocean, Gulf Islands and snowy peaks unfold as you journey up the mountainside.